The International Buddhist Conclave—the sixth and most ambitious iteration in terms of scale and program—took place on 23–26 August. On the first day its hosts made an effort to assure Buddhist delegates how much India treasures Buddhism as its spiritual child. Tourism ministry secretary Rashmi Verma and minister of state for electronics and IT Alphons Kannanthanam, along with the president of India and local ministers who had come to showcase the Buddhist attractions of their states, repeated several times the idea that India, by proxy of it having been the birthplace of Buddhism, deserved to be seen as a country where Buddhism has a substantial presence, much like in the conclave’s partner country, Japan. Population matters and I am confident that Buddhism, observed by 0.02 per cent of the Indian population, would be treated quite differently if that percentage were more prominent among the Indian population. Nevertheless, this does not mean that Buddhism is not part of the Indian historical and cultural orbit. 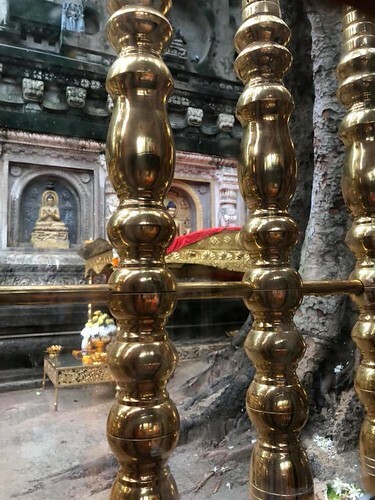 The Buddha attained enlightenment in what is today Indian soil, in Bodh Gay, Bihar, where the holy Bo Tree stands at Maha Bodhi Temple, shading the Diamond Throne (vajrasana). While he was not “Indian” in the sense of having some national identity or belonging, it is undeniable that he lived and breathed the Indic worldview of karma, rebirth, and Nirvana, reworking them according to his own unique insights. Why should India not trumpet its Buddhist tourism circuit, which covers not just the holy sites of the Buddha’s life but also sites such as the Ajanta Caves (which we visited during the conclave, along with Nalanda, Maha Bodhi Temple, and Sarnath)? Surely the world’s Buddhist nations should encourage and even help India to re-ignite its own Buddhist torch, even if it is through tourism? These are commendable intentions. However, certain issues need disentangling for long-term progress to be made in future conclaves. In her speech at the opening of the conference, Secretary Verma put a noticeable emphasis on the job and investment opportunities that would be available to India and the world if only three sectors—private business, government, and Buddhist institutions within and outside of India—could align with each other’s objectives. However, from what I gathered and from what other Buddhist delegates said during the conclave, “Buddhist tourism circuit” is a term that blurs several distinct agendas. Even the idea of promoting pilgrimage programs and itineraries to other countries, especially in a diffuse way via tour operators, businesses, and Buddhist leaders, can stimulate days of discussion, and requires more than one conclave. There are Buddhist pilgrims, and then there are tourists who go to Buddhist sites. They are not always the same. Buddhist representatives might be relatively united on the idea of restoring the “hardware” of pilgrimage sites, such as visitor centers and pilgrim guides, along with infrastructure such as roads and hotels. Japan has invested significant funds in at multiple locations in India, including Gaya and Bihar. Yet without concerted effort from within India by its Buddhist organizations, India could remain known as a country where Buddhists go to for pilgrimage, rather than a country in which Buddhism thrives. The pastoral dimension of local Indian Buddhists, as many foreign delegates at the roundtable noted, remains almost completely absent. India needs to articulate the kind of Buddhist presence it wants to see, and this is fraught with domestic and pan-Asian political problems. Indian Dalits convert to Buddhism to reject the Indic caste concept, which is officially outlawed but remains socially accepted in India, while the ruling BJP walks a delicate tightrope (partly of its own making) between balancing the needs of the country’s many religious lobbies while riding the oft-unpredictable Hindutva bull. It is constantly watching itself and calibrating its views about Buddhism to be consumed in different ways domestically and overseas. It must be close to the Buddhist religion—but not too close. Looking to build on the conclave’s positive direction, I think it is important to stress the necessity of increasing dialogue between the involved parties (government, business in the form of tour operators and private investors, and Buddhist leaders) at a more official level. While we [the delegates] enjoyed being taken on pilgrimage to India’s holy sites, we also wished to deliberate on strategies to attract specific demographics. Tour operators came from all around the world this year, but some are not sure how to package and promote the ruins of a Buddhist super-monastery like Nalanda. Since I began covering India’s civic diplomacy that utilizes Buddhism, I have come to appreciate, as a Buddhist, the factors behind sometimes-ambivalent signals—including from individuals or factions who are strictly Hindu or who have an “Indic civilization” agenda in mind when speaking of Buddhism. The stakes are admittedly high. India sees itself surrounded by competing narratives of Buddhist legitimacy from Sri Lanka, Nepal, and even Pakistan and Afghanistan. Just beyond Pakistan is China, which shares with India the claim to being a “civilization-state,” since both countries possess a national rhetoric of having developed as “cradles of civilization” (along with Egypt, Greece, and Iraq). I believe that the tradition belongs to both civilization-states—or, better put, Buddhism belongs to everyone and transcends all. Nevertheless, the partnership between India and Japan, launched after the Samvad initiative by Modi and Abe in 2016, was no accident in trying to shape a narrative that did not depend on traditional ideas of civilizational cradles. It is true that India enjoys the advantage that the vast majority of Buddhist monuments dating to the Buddha’s time and the centuries immediately succeeding it are located on its soil. Indian circles wishing to integrate the religion’s back into the country’s civil, cultural, and spiritual fold have rightly stressed that the dispensation of the Buddha’s teachings, the sasana, owes its earthly diffusion to the Indic cultural sphere. However, India cannot accomplish a truly sustainable revival of Buddhism without listening seriously to diverse spiritual, diplomatic, and corporate opinions about the Buddhist circuit and other initiatives. I want India to succeed—in the right way. Because I cannot get this image out of my mind: a child is born into a family that, while initially nurturing her, comes to neglect her. Some time later, she runs away from home and finds that other families in the village welcome her presence. After many years, her birth family implores her to return. The child, now a grown individual, will go home as an equal. It must be treated like one; neither condescended to nor sidelined.